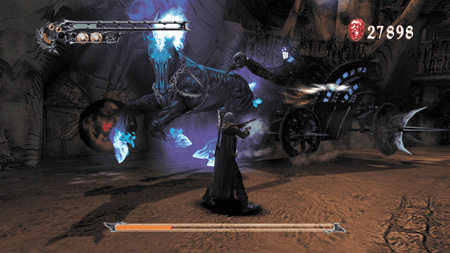 Devil May Cry HD Collection is a combination of the popular stylish action games Devil May Cry, Devil May Cry 2, and Devil May Cry 3 Special Edition. As Dante, the ultimate devil hunter, you’ll join forces with appealing characters such as Trish, Lady, and Lucia and enjoy incredible action for the first time in blistering 60fps. Devil May Cry: The first appearance of Dante, the ultimate devil hunter. With the blood of a legendary demon warrior flowing through his veins, Dante takes on the king of the underworld, Mundus. This entry was posted in Nintendo Games, PC Games, PS4 Games, Walkthrough and tagged Devil May Cry HD Collection Cheats, Devil May Cry HD Collection Gameplay, Devil May Cry HD Collection Guide, Devil May Cry HD Collection Hints, Devil May Cry HD Collection Review, Devil May Cry HD Collection Solutions, Devil May Cry HD Collection Strategy, Devil May Cry HD Collection Tips, Devil May Cry HD Collection Walkthrough by Marvin. Bookmark the permalink.